On 21 April 2016, the second day of the aviation exhibition AERO-Friedrichshafen, the pilot of the pistoned-engine Piper PA-28RT-201T, registration OK-ELL, with three passengers on board, made initial contact at 08:03:27 UTC with the Friedrichshafen (EDNY) aerodrome control on frequency 120.075 MHz for landing. The pilot notified the air traffic controller that he had passed Kempten and was going to descend to 4000 ft QNH. At the aerodrome control of Friedrichshafen Airport two air traffic controllers’ workstations were allotted with the descriptions VFR Pick-up, respectively PL-Main. After initial contact, the pilot of OK-ELL was instructed by the VFR Pick-up controller to fly directly towards the waypoint OSCAR, north-west of the airport, thereby remaining outside of the control zone (CTR). Roughly four minutes later, the crew of a Fokker 50 with flight plan call sign VLM 22TX and 33 passengers on board, made initial contact with the radar executive (RE) air traffic controller of the approach control (APP). The latter then issued a heading and a descent clearance with the intention of guiding VLM 22TX via a right-hand base towards a waypoint situated on the extended centreline of runway 24 and approximately 11 NM from the threshold for an instrument approach. When OK-ELL was roughly 20 NM east of the airport at an altitude of 4000 ft AMSL, the pilot was cleared by the VFR Pick-up aerodrome controller to join the final approach leg of runway 24. At 08:12:49 UTC, the flight crew of flight VLM 22TX was cleared by the RE air traffic controller to descend to 5000 ft QNH. Half a minute later, they were cleared to turn to a heading of 150 degrees for the base leg, coupled with the clearance to descend to 4000 ft QNH. After having been transferred to the PL Main air traffic controller, the pilot of OK-ELL called on frequency 134.300 MHz at 08:13:44 UTC on long final to runway 24. At 08:13:58 UTC, the PL Main aerodrome controller instructed the pilot of OK-ELL to turn right towards the waypoint OSCAR and to remain outside of the CTR. At 08:14:06 UTC the ground based short term conflict alert (STCA) generated an alarm between VLM 22TX and OK-ELL, followed ten seconds later at 08:14:16 UTC by a traffic information provided to the flight crew of VLM 22TX by the RE air traffic controller concerning an unknown VFR traffic. He then provided a second traffic information at 08:14:37 UTC. Despite good visual meteorological conditions, the visibility through the flight deck windows of VLM 22TX was impaired by the reflection and position of the sun, which is why the flight crew could only identify and follow the intruding traffic at the same altitude with the information displayed by their traffic alert and collision avoidance system (TCAS). The commander subsequently decided to initiate an avoidance manoeuvre by turning 90 degrees to the right. 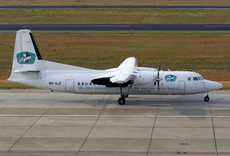 At approximately the same time, following the traffic information, the pilot of OK-ELL reported that he had visual contact with the Fokker 50. During the avoidance manoeuvre of VLM 22TX, the two aircraft crossed at an altitude of approximately 4000 ft AMSL. The closest point of approach at 08:14:54 UTC was 0.5 NM horizontally und 100 ft vertically. Both aircraft continued their approach without further events. The serious incident is attributable to a dangerous convergence of two aircraft flying on a converging course in airspace class E during an aviation exhibition, during which time the commercial aircraft flying under instrument flight rules was in contact with the approach control, while the light aircraft flying under visual flight rules was in radio contact with the aerodrome control. - The operational concept consisting of the simultaneous approach of traffic under visual and instrument flight rules during the trade fair entailed systemic risks. - The pilots of both aircraft were not in radio contact with the same air traffic control unit. - The traffic guidance within the aerodrome control service concerning the light aircraft approaching under visual flight rules was coordinated inadequately. - The traffic alert and collision avoidance system on board the commercial aircraft did not generate a resolution advisory due to a lateral avoidance manoeuvre. - The traffic information provided by the aerodrome control to the pilot of the light aircraft was given too late. - The pilots of both aircraft only acquired a late visual contact of each other. The current classification of the airspace, in which the dangerous convergence took place, contributed to the occurrence of the serious incident.